Preheat oven to 425 F. Lightly oil a cookie/ baking sheet or line with parchment paper. In a food processor or by hand, whip the egg replacer and water together until thick and creamy. Set aside. In a large bowl, combine the flour, sugar, baking powder, and salt. Add the vegan to the dry ingredients and cut it into small pieces with two knives or with a pastry blender. You’re not creating a paste; you want a course crumbly batter that resembles bread crumbs. (To make flaky scones, leave some of the butter pieces as large as peas.) stir in the cranberries. Add the vegan milk and vegan egg replacer mixture, and keep the mixing to a minimum to avoid developing the gluten in the flour (which produces tough scones). Mix with a wooden spoon, fork, or your fingers just until the dry ingredients are moistened or nearly moistened. The dough will not be completely smooth like bread dough. Gather the dough into a ball (you may need to add just one more teaspoon of nondairy milk or water, but you will be able to form it into a ball), and place on a lightly floured surface. (you may want to lightly flour your hands, as well.) Pat or roll the dough out to a 1/2-inch apart on the baking sheet, brush the tops with nondairy milk, and sprinkle with some cinnamon and sugar. In my work as a teacher and art coach I’m often asked if there’s a book I would recommend on color. I’m always reluctant to suggest a book because I rarely see a book that teaches it really well. The problem in teaching color is that it’s hard to really transfer the system of color theory to art making. There is a disconnect between the knowledge about and intuitive application of color. My approach is to offer experiences that allow a person to become more familiar with colors in an intuitive way. Then I bring in color theory based on their experience of a color and what they used. This makes the learning more tangible. It’s been awhile since I gave an art experience to Art and Ideas followers. You don’t have to be a visual artist to benefit from it. Here it is. Find something red in your house and set it in front of a bright window. Take several deep breaths down into your gut. This will make you more attuned to the color. Now notice how that color makes you feel. Does the color excite you? Does it relax you? Does the light hit this red object directly? Does it warm the color of your object? Do certain associations occur when you look at this red object? PS: If you’re interested in working with me through a visual art coaching relationship, contact me at shacha@imshacha.com. I’m offering a free half-hour session by phone for people I haven’t coached by phone before. I can then explain the effectiveness of email and phone sessions. Last week I re-introduced you to to one of my artworks: “Albuquerque Man 1” (part of the “Cityology” photography Project). Looking at artwork is a key way to alter your perceptions, thus allowing you to experience what the artist experiences when they initially create their art. In past emails I described a technique called VTS (visual thinking strategy) to explore art. This is where you enter the artwork by describing what you see, and then interpreting what you see. I’ve shown this photograph in a few audiences, and this is how they described Albuquerque Man 1…. 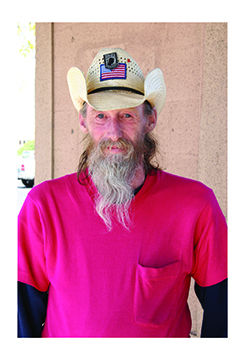 Now from me, the artist’s point of view: I was walking around Albuquerque and I found many intriguing people to photograph — this is what initiated this project.. As soon as I saw “Albuquerque Man 1,” I became super-excited. I ran over to him, because I didn’t want to miss this shot. I couldn’t keep my eyes off him because his whole paraphenalia interested me — especially his beard and hat. As soon as I got close I looked at his eyes, and they were soft and light. I was so nervous that he would not agree to the photograph. But when I asked him he responded with a yes. I was jumping up and down inside. I felt I’d captured a kind of timelessness. To collect an archival print of “Albuquerque Man 1,” send me an email of your interest, and I will let you know about the size and rate. I have been writing you lately on how early experiences directly affect creativity, talking about my early experiences of being raised in America, while also growing up in an Albanian culture. It was a huge contrast which in turn affected my perceptions. I attribute this “duplex” way of living as being a conduit to my creativity. Last week I wrote about comedian John Cleese who attributed early experiences of moving a lot and being exposed to many kinds of people, which in turn affected his creativity. I’ve worked on many projects over my 25-year career as an artist. (However, I’ve been making art since I was 8 years old; I’m only counting my professional life over the last 25 years.) My perceptions were directly affected because of my experience of living two cultures simultaneously. One project I’ve been calling “Cityology” explores how similar people migrate in the same location. Mike and I spent 4 months in Albuquerque in 2009. That is where I began this project. And below is one of my first photo portraits that began this project — and truly one of my favorites. You can participate by responding…. What do you notice about him? Explain any interpretations about him that you have. He and his family moved often when he was young, so he was able to meet and experience different people in his early life. He says this experience of living in different places and meeting different people and viewpoints encouraged his creativity — and it’s something that aids creativity in general. Last week I shared with you my own significant early experiences of living in two cultures simultaneously. I too felt this was a game-changer in my own creativity. I saw two different worlds simultaneously. When I went to school I experienced another world, and when I came home I felt as if I was in a different space and time. So what “moving” early childhood experiences affected your creativity? Next, week I’ll share some thoughts about a photography project that explores identity in various parts of the country. I am an Albanian-American (but that’s not the secret). I was born in Montenegro (former Yugoslavia). I was one year old when I came with my family to Detroit. Although I lived in America ever since, I often felt I lived in two cultures. When I was in school or with other kids I felt American, but when I was home and with extended family I felt Albanian. This experience of living in two cultures simultaneously affected me greatly. It gave me insight about people and cultures that I would never have learned in the classroom. The one thing that was obvious was the different social rules that you had to follow within the Albanian culture. Some of these rules included certain roles for both men and women. For instance, most people don’t know this about me, but I was almost in an arranged marriage when I was 18. I did not go through with it, because of my immersion in American culture and having different options. After this experience I wanted nothing to do with Albanian culture. As I got more immersed in American culture in my 20s, I saw the cultural rules in American culture as well. Many of these cannot be seen due to our cultural immersion, but they exist. This cultural perspective opened up a new doorway artistically. It gave me a perceptual shift that allowed me to see from a different vantage point about American culture. One of my artworks that explored this was American Woman. The print is 4 feet by 6 feet and was shown at the Modern Museum of Art in Saitamo, Japan. Below is the image of the print. In it are images that construct some of the experiences of American Women. If you would like to own a reduced-size version of American Woman, you can buy a poster or an archival poster (meaning it will last 250 years) of this print. A signed 18″ by 28″ archival poster, unframed, is $120 (only offered for the above version no the left): one framed one is now available for $150 (a deal–it costs about $40 to frame it). Email (imshachaatme.com) me back about your interest in which you one you would like to purchase. You can either pay by Paypal or check. Own the print so you can thoroughly explore the images of cultural roles for American Women. I think the artwork does it better than me explaining it in words!